What kind of in-ground pool should I get? One of the first decisions you need to make when you are thinking about getting a swimming pool. What kind of pool constructions are there? And what one is best for you? The way you build your pool can impact the cost; design; maintenance and installation time. To make the right decision you need to know the advantages and disadvantages of each different pool construction. To make the right decision for you. What are the options for in-ground swimming pools? 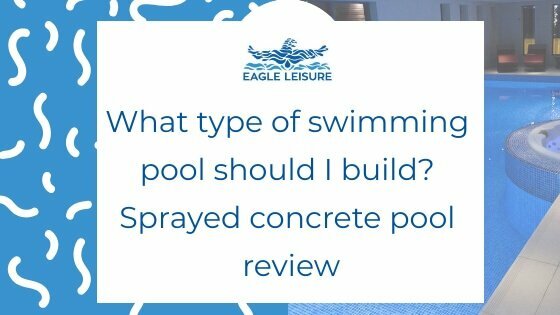 What is a sprayed concrete pool? It is an extremely strong pool construction and is built using reinforced steel rods to form the shape of the pool. This is then sprayed with concrete to form the base of the shell. This is then waterproofed using render. And finally tiles are usually applied to the surface to finish. It is the ultimate in bespoke luxury and is traditionally what people think of when considering a pool construction. 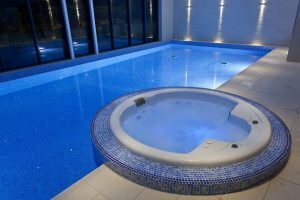 It’s common to see these types of pools in commercial properties such as hotels and gyms. Or in high-end pool installations in homes. Sprayed concrete pools are very popular, especially amongst high-end and commercial pool installations. It’s usually what people imagine when they first think of getting a pool. Sprayed concrete pool are constructed on site. Steel rods are placed into the ground and the concrete is sprayed into these to create the strong structure. Therefore, a sprayed concrete pool can be built to any size. And any shape. This is why they are common for commercial, olympic sized pools as there are almost no limitations to the size. Again, as the sprayed concrete pool is built on site it can be moulded to any shape and any features can be incorporated into it. This give you endless opportunity and you can create a swimming pool to suit your style and the space that you have. However, we find that almost everyone goes with a fairly standard shape, so the chances are you can get the same look and effect with another type of pool construction. Concrete pools are one of the most durable of all pool constructions. If built well, concrete pools are built to last a lifetime. If you don’t look after them, you may need to refurbish the tiles, which can be very pricey. But, the structure will last a lifetime. What are the disadvantages of an in-ground sprayed concrete pool? Sprayed concrete pools are what most people think of when they think about installing a swimming pool. As it’s usually what they will have seen. However, that doesn’t mean that it is always the best option for you. All pool are expensive to build. But sprayed concrete are usually the most expensive to build. This is due to the construction, time take and the tile finish which is usually incorporated into the design. You can expect to pay approx. £75,000-£150,000 for a sprayed concrete pool. However, depending on what size and design you go for this can be much higher. Concrete pools are usually finished with tiles. This makes the surface more porous than other pool constructions. And as such, there are more crevices for the growth of algae. This means that more maintenance and chemicals will be required to keep the pool algae and bacteria free. Additional sanitiser, algaecide and regular brushing of the walls will be necessary. The calcium hardness of the water also needs to be monitored closely as the water will naturally source from the grout if that calcium levels are low. This will eventually cause the tiles to fall off the wall if not kept in check. Sprayed concrete pool take longer to install. After the concrete is sprayed, the pool needs to be rendered and stand tested. Once it is holding water it will be tiled. The whole process can take 3-6 months However, it is not unusual for us to work with concrete pool customers for over 2 years from start to finish. Of all the pool types that we work with, concrete pools are the ones that we see the most problems with. Concrete pools usually require a lot of trades working together. And they have a lot of stages where things can go wrong. We’ve worked on our own pools from start to finish. And we’ve taken over from other pools part way through construction. And they without a doubt, have more issues than any other type of pool construction. It is for this reason, that we have decided to stop offering new build concrete pool and focus only on one piece and liner pools. Concrete pools are typically what people think of when they think of building a swimming pool. And there are many great features of concrete pools that can make them a great choice for you. But, there are also a lot negatives associated with concrete pools. They are more expensive, require more maintenance, have long installation times and have more problems than any other pool construction type. For these reasons, we have decided to not to offer concrete pools any more and focus on liner and one piece pools.